Mix and Chic: Makeover Miracle- From Simple Boys' Room To Fabulous Bedroom With Built-In Bunk Beds! 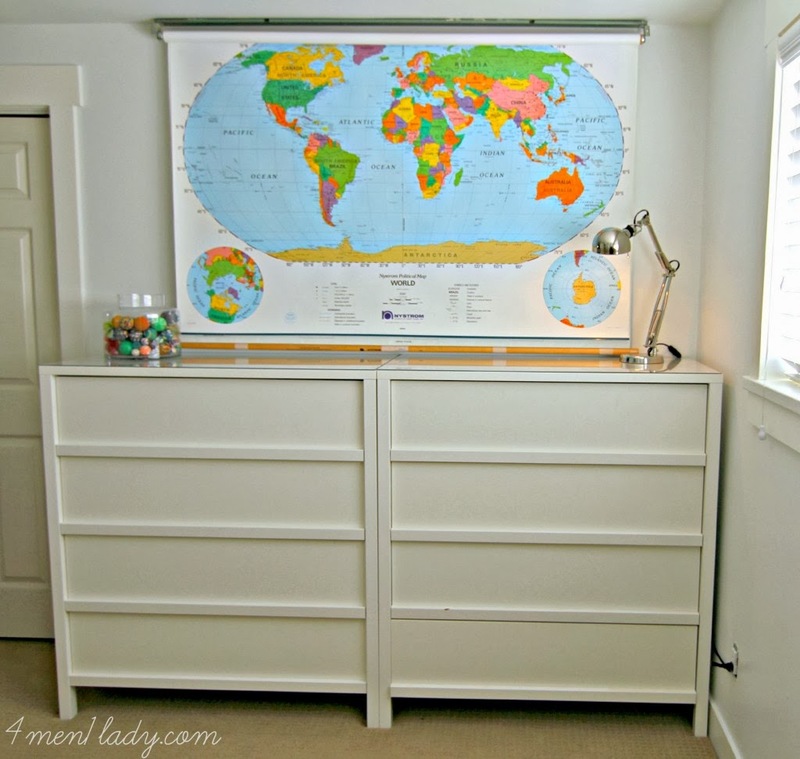 Makeover Miracle- From Simple Boys' Room To Fabulous Bedroom With Built-In Bunk Beds! First of all, let me make a confession. I have been following this very talented blogger forever! She is none other than Michelle from 4 Men 1 Lady (formerly known as 3 Men And A Lady). I have been her fan since her 3 Men And A Lady's days! She absolutely has a knack for decorating. So don't forget to take a tour of her beautiful home here and her previous home here when you get a chance! Recently, she shared her boy's bedroom reveal on her blog and I was absolutely wowed! I am sure many of you have seen amazing built-in bunk beds on Pinterest, but how many of us actually built them from scratch? Well, this girl did (with some help) and it turned out super-duper fabulous! Check this out! Aren't those bunk beds awesome? No details were overlooked. 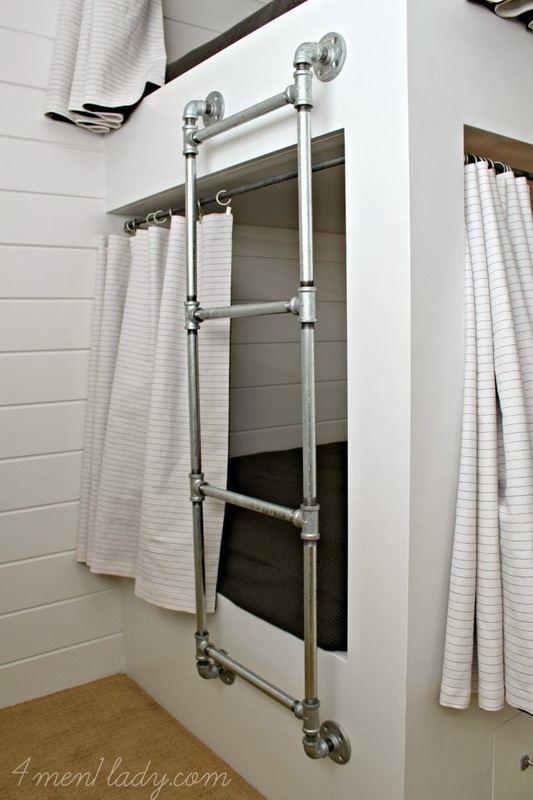 A ladder and curtain rods made with plumbing pipes for that effortless industrial look? Check! Double-sided curtains for a fun, custom touch? Check! A special nook for a clock, books and fun trinkets? Check! 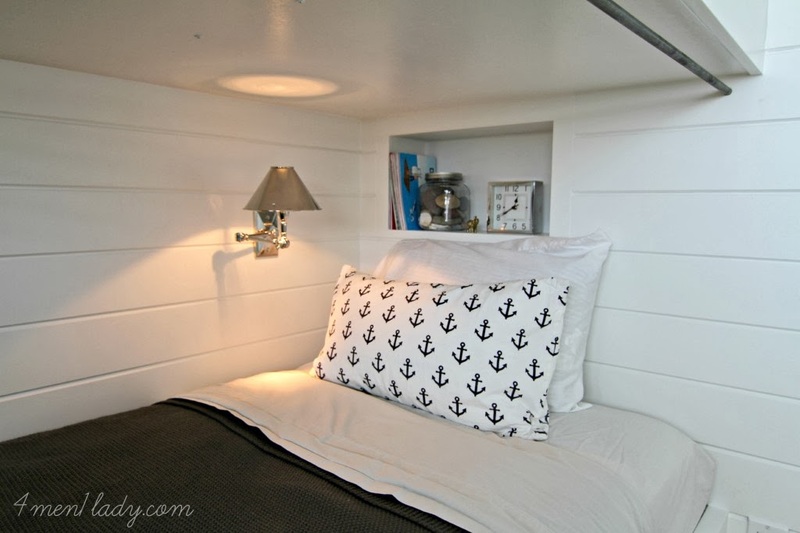 Anchor pillows and beautiful wall boards for a nautical feel? Check! Silver wall sconces for late night reading? Check! A colorful world map to tie the whole design together? Check! I just love a project that is well thought-out, carefully planned and beautifully executed. This is definitely one of those projects! Don't forget to check out additional pictures of this fab bedroom, the befores and progress here. I am obsessed about this room, what about you? Thoughts? I saw this at 4 men and a lady too and it is totally fabulous! 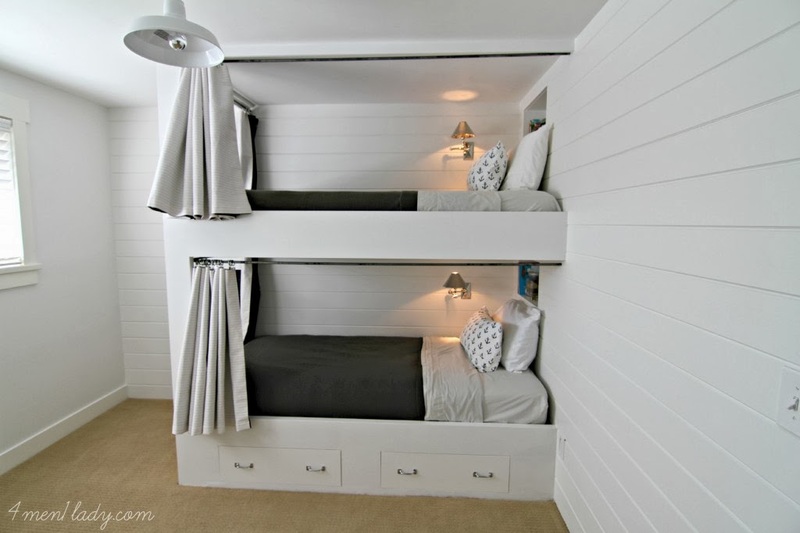 Only complaint I have though is that the ceiling of the bunks seem too low and with her big kids, they might end up bumping their heads in there all too soon, also the wall sconces are stylish but I'ma fraid it will get to hot and the kids could burn themselves- pretty definitely, practical, no. Oh my gosh I love this!! I really want to build something like this for my kids once we own our own home again and can do stuff like this! Hers look SO good! I'm going to go over to her page so I can pin these and save them for later! Thanks for the feature Jesse! I'm just as big of a fan of yours! Hugs. Very impressive! I will have to check out the rest of the space. Thanks for sharing!